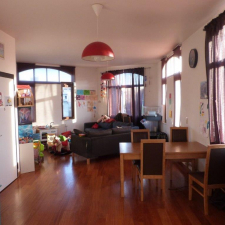 All bills included, recently refurbished, fully furnished 2 bed apartment in a small building 5 mins walk from Midi Station in central Brussels. The monthly rent includes all amenities and fees, along with a Proximus Maxi unlimited 100 MBPS broadband connection. There is nothing else to pay. It is a small, friendly block with one flat per floor, a lift and a cave which straddles the corner of Rue Charles Parentee and Rue Bara. It has windows all the way around giving a lot of light and a great view over Brussels at night. There are two good size double bedrooms with wardrobes, a very large open plan kitchen/dining room/living room area, bathroom and separate WC. The flat is available from Feb 1 on a rolling six month contract which can be extended as required.